If you don't know Blogger Love! is a series here on Hebridean Sprite Beauty that features some of my favourite bloggers that feature nail polish, skin care and cosmetics. Today's is G from Nouveau Cheap who only features items under $20 and is the drugstore and coupon Queen! She's also really friendly and approachable which I think in a big time blogger (she's very popular!) is a really great virtue to have. Responding to email. There is never enough time in the day, unfortunately. 7) First makeup brand that really got you interested in cosmetics? 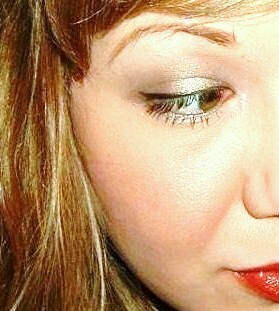 It was the L'Oreal Shadow Riche eyeshadows from the 80s. Once I tried those, I was hooked. 9) What is your favourite food? Drink? Food: Nothing compares to homemade baked macaroni and cheese. Drink: The Good Earth Peach Black Tea. I could drink a gallon a day. I'm not really a jewelry person but I love opals. 12) One place you’ve never been that you want to visit? I cannot believe I've still never been to NYC. That's at the top of my list. 13) What inspired you to start your blog? I used to work in an office where I was kind of the go-to person for all things beauty-related. One day one of my colleagues urged me to start a blog, so I eventually did it! 14) What are some of the most useful things you’ve learned about since you started blogging? If you work hard, you're passionate and you write from the heart, the rest will fall into place. 16) What do you use to take your blog photos? What type of computer? I have two cameras and neither of them is fancy. One is quite old but excellent for close-ups, while the other is newer but under $100 and I use it for outdoor shots. I have a very standard PC--nothing fancy there either. 17) What genre of movies/books do you like? I'm all over the place when it comes to books. I just finished re-reading Invisible Man by Ralph Ellison, and then I read Shock Doctrine by Naomi Klein. I love fiction and nonfiction equally, but there are some genres that just don't appeal to me such as romance and chick-lit. I like difficult books that force me to think critically. If I want fluff, I'd rather turn on the TV! 18) Other hobbies or events that you’re involved in? Blogging is my number one hobby, but I love to cook and bake (I'm a better cook than baker) and I love arts and crafts. I was really into jewelry making a while ago and I'm kind of doing that again in my free time. 19) Most unique eyeshadow you own? Probably my original Urban Decay eyeshadow single in Road Stripe. I bought it when Urban Decay first came out in the early 90s (when the packaging was made of metal) and it's been long-since discontinued. 20) Most unique lip product? I have a few MAC lipsticks that are quite old and were discontinued many years ago. They're pretty unique. I'm an earth-tone gal. I love soft, well-blended looks with lots of browns, taupes, golds, bronzes and olives. 22) Favourite piece of jewelry? Why is it your favourite? All of the women on my mom's side of the family wear the same bracelet on their left wrist. As soon as you're old enough to wear a bracelet you get one from your mother and when you outgrow it, you get a larger one. We literally never take them off, so that's my favorite piece of jewelry ever. 23) Best drugstore product you’ve tried? I can't possibly answer that, given the theme of my blog! 24) Random fact you'd like to share about yourself? I hate tomatoes in sandwiches, yet I love them in salads. 25) Favourite Nail Polish Brand and why? Oh wow..I don't think I can narrow that down! But some of my favorites are China Glaze, Sally Hansen, Wet n Wild and Maybelline. 26) Most unique polish you own, why? It's actually not too unique but it's one of those coveted flakies: Sally Hansen Hidden Treasure. 27) Favourite polish colour to wear? A year ago I would have said taupe/greige/mushroom, but I'm afraid I've burned myself out on those lately. So I'll go with a nice olive green shimmer. 28) What are the best top coat, base coat, treatments you’ve tried for your nails? I really love the Essie quick-dry top coat for when I have zero time to wait for my nails to dry, but I also LOVE the new Milani top and base coats. They work beautifully together and really extend the life of my manis. I'm a sucker for a beautiful creme, but I also love holos of course. I want to thank G so much for taking the time to do this! If you've got the time you should definitely check out her blog- she's my drugstore go to girl for sure!